Premium Account Time is now on special offer. 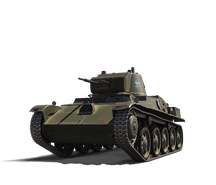 Purchase 90 Days of Premium Account Time and receive the II L-60 and a garage slot for free! If you already own L-60 and still want this package, don't fret! You'll be compensated 500, the Gold value of this tank, if you buy this package despite already owning an L-60. Check below to learn more about the tank. Hang on, what's this all about? Not familiar with Gold, Credits, Premium Account Time, and Personal Reserves? Click the banner below to learn all about how it works! Hull and turret armour are weak. If you already have this vehicle, you will be compensated 500 Gold.